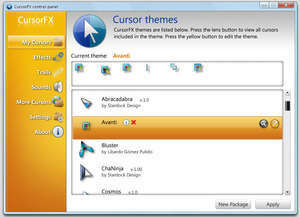 CursorFX is a free program which provides you with the welcome ability to change the look of the cursors on your Windows system. It comes in both a free and premium version. Many of the most useful features for basic cursor management are available in the free version, though if you want some extra features like trails, mirroring, special effects, etc. then you might want to upgrade. Version 2.16 is a freeware program which does not have restrictions and it's free so it doesn't cost anything. For security reasons, you should also check out the CursorFX download at LO4D.com which includes virus and malware tests. Additional screenshots of this application download may be available, too. CursorFX has a presence on social networks. CursorFX download been highly rated by our users.